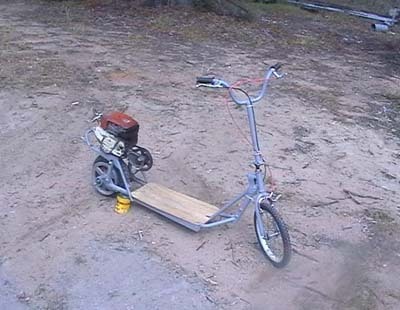 I used a 27cc MobilCo chainsaw engine which I found in the shed. 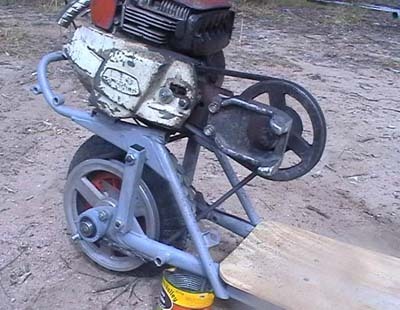 The 13-inch rear wheel is off an old wheelbarrow and driven by a v-belt system. the first belt runs from the clutch on the chainsaw to a 6-inch pulley on a jackshaft. the second belt goes from the 2.5-inch pulley on the jackshaft to a 9-inch pulley on the rear axle. The overall ratio is about 10.5 : 1. 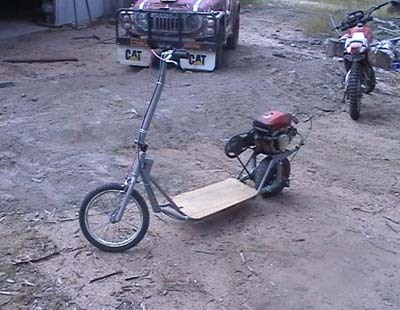 It took a week to make and total build cost was 60 bucks! $35 for bearings and housings, $15 for v-belts and $10 for paint. 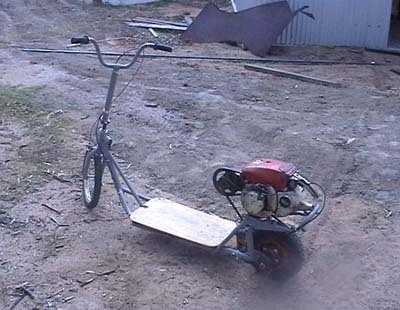 It goes pretty quick and has good acceleration for a chainsaw, good cheap fun.